I feel like I've been jumping all over the place with my costumes lately. I'm at different places with each costume that I'm working on and when I'm stuck waiting on something (whether it be fabric, inspiration, or just procrastinating) I still have the need to be working on something which usually means starting a new project. 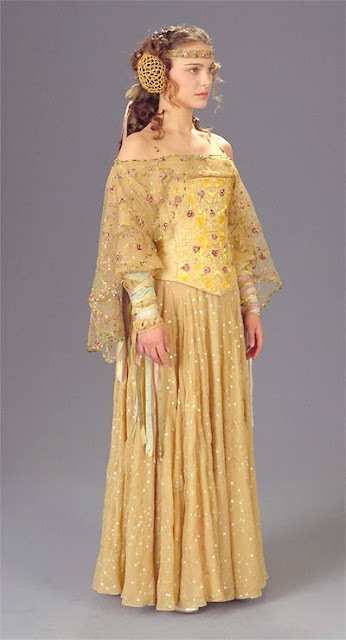 In this case, it's my next Star Wars Cosplay, Padme's Picnic Dress from Attack of the Clones. I started the mock up several months ago (I think back in November) because I didn't have anything better to do and I was experimenting with new-to-me drafting techniques. However, I didn't finish the mock up and pattern it until about a week ago. I also decided on this particular dress because near the end of summer I found most all of the material's I need at Goodwill for about $30 and I realized May the 4th is coming up and I need to actually make a costume this year. 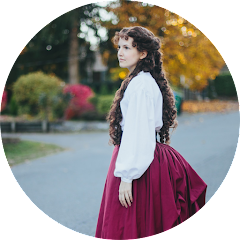 This costume consists of 4 main pieces: the skirt, the "corset" bodice, the blouse, and the shawl. Skirt - This has been one of the more confusing pieces for me to figure out. I'm not sure what the shape is because as you can see in the photo above, it lays relatively flat in the front but has much more fabric gathered to the sides. The skirt is embroidered and has 4-leaf clover sequins that are also on the shawl. For my costume, I decided on making the skirt with 5 A-Line skirt panels, making the side and back panels with more fabric than the front to try and replicate this. I'll be making this from 3 layers: the top layer, which is chiffon, the middle "petticoat" layer which is a yellow nylon fabric, and the lining layer. All three layers will be stitched onto a basic waistband and will close with an invisible zipper. Bodice - I've seen a lot of people refer to the bodice as a "corset" but it's not. A corset is a structured garment that shapes the body. This is just a bodice that resembles a corset in shape and closes with a zipper closure in the back. It's boned, but if you look at promotional photo's you can see wrinkles in the fabric that indicate that it's only lightly boned. It's also heavily embroidered at the front. I'm making my bodice from 3 layers: a crinkle nylon fabric for the top layer, canvas for the middle support layer, and a lining on the inside. Blouse - The blouse sits off the shoulder, has spaghetti straps, and has long, wide sleeves that are gathered and tucked at the forearm and wrist. In this behind the scene video from Dressing a Galaxy, you can actually see this costume hanging and the blouse is attached to the "corset" bodice. I'll be using the same chiffon as I am for the skirt. Shawl - The shawl is pretty simple. 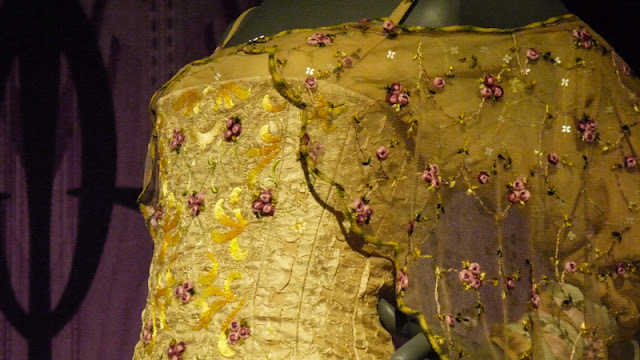 It's made of a mesh fabric embroidered with flowers and has an embroidered scallop edge. It sits on the shoulders along the same neckline of the blouse and is pinned closed at the front with a dragonfly broach. The fabric I'm using for this is a curtain panel that already has the same design (flowers and all) embroidered on it, it just needs to be dyed a slightly more yellow color. Accessories for this costume include: a small dragonfly broach (mentioned above), green, yellow, and pink silk ribbon's tied around the wrists and in the hair, crocheted hair buns, embroidered ribbon headband, and of course shoes. 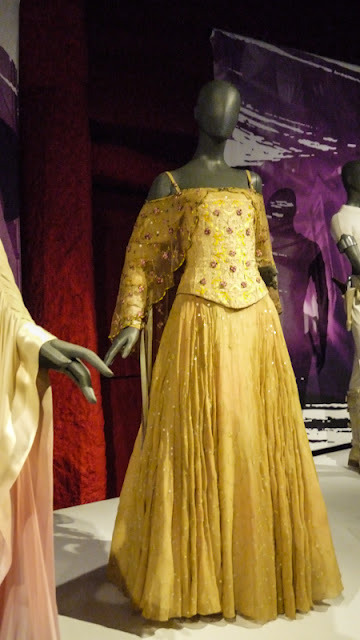 Padme's shoes are some of the hardest things to get information on because they're rarely seen in the films or BTS footage because of her long skirts, however there are photo's of the shoes from when the costume was worn in the Rose Parade. Picture via The Padawan's Guide. So where exactly does that leave me? 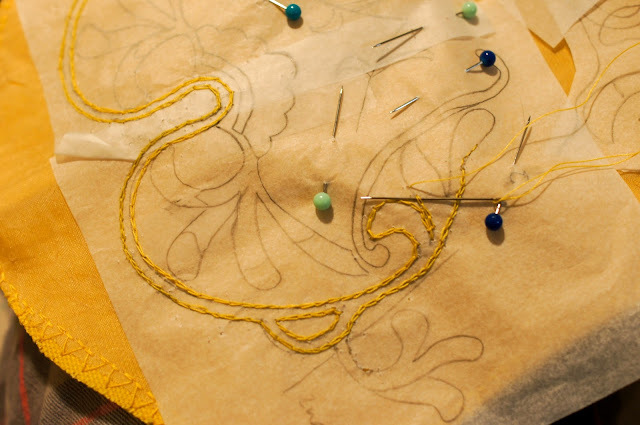 Well, right now I'm at the embroidery stage on the bodice. I'll be writing another blog post soon with more details about my making of since this post was more of a costume analysis. Until then, here's a little peek at what it currently looks like. I'm trying to figure out how they did that skirt. It almost looks to me like they sewed in a triangle of fulness (like a gusset for a corset...except not) because you can add a lot of extra fabric in a very specific place, without bulk at the top.